Double-sided cutting from magazine concerning the "Duke's toothpick". a steam engine plough and the retirement of Major & Mrs George A.B. Sutherland. 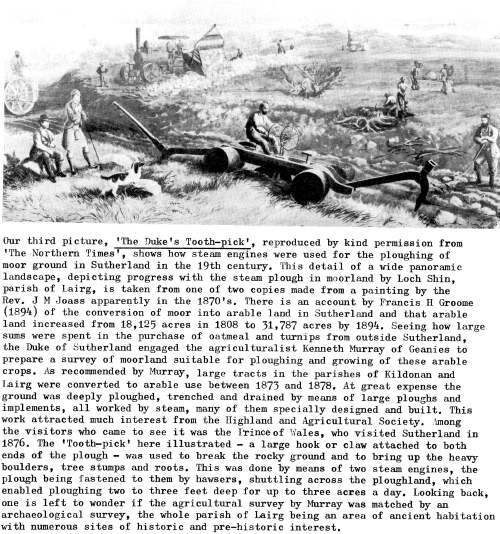 The article includes a copy of a picture of plough in the 1870's. Very interesting picture, and commentary. The answer to the .. question as to whether the agricultural survey was matched by an archaeological one, is probably yes, or in a sense yes, as the artist, J.M. Joass, LLD, was interested in such things, and depicted and described some.